Universal Wellbeing PTY Limited - Each issue of the magazine features step-by-step easy-to-follow project ideas and accompanying patterns sheets, a variety of crafts including quilts to bags to dolls, inspirational photographs of fantastic finished products plus interesting reads to engage and entertain. Homespun is a publication that is at the forefront of the industry, made by people who are passionate about craft. Homespun magazine is a place of inspiration, it combines creative techniques with a vast array of styles and themes taken from a team of leading craftspeople throughout Australia and the world. Immediate Media Company London Ltd - We can't resist hunting down treasures in thrift stores, buttons and beads, then customising, re-covering and embellishing our finds with our endless stash of ribbons and bows, fabrics and felt. We're forever on the lookout for new inspiration. We love to make - handmade is more than just a hobby for us, it's in everything we do. Mollie makes is a brand new lifestyle and craft magazine which brings you the best of craft online, a look inside the homes of the world's most creative crafters, tutorials on inspiring makes, round-ups of the most covetable stash and tours of the crafty capitals of the world. Whatever we do, we're living and loving handmade. Mollie Makes - Curating the best contemporary craft from around the world into a beautiful and totally irresistible magazine. Homespun Media, LLC - The industry's only magazine dedicated to the primitive artisan. At least 15 full patterns in each issue from quilting to rug hooking - all primitive/folk art style. Inspirations Publications - A wide variety of embroidery techniques is presented with detailed and easy to follow instructions, step-by-step tutorials and full size patterns, making each issue a valuable resource for people new to embroidery and seasoned needleworkers alike. Referred to by readers as 'the world's most beautiful embroidery magazine', Inspirations is where you find the best classic hand embroidery by leading embroiderers throughout the world. Complemented with superbly styled photography and captivating stories, each issue brings a diverse collection of timeless projects from home wares and bags to gifts and accessories. Warners Group - The essential hands-on magazine for creative stitchers, STITCH with the Embroiderers' Guild brings you traditional embroidery techniques and also a wealth of creative contemporary ideas. Universal Wellbeing PTY Limited - We pride ourselves not just on being an instructional publication - we are a good read as well! Published since 2001, Quilters Companion provides readers with exciting quilting projects. These projects are accompanied by easy-to follow instructions and accompanying pattern sheets, stunning styled shots and interesting stories about the featured projects. Quilters companion is the definitive patchwork and quilting magazine. Tucats Media CC - Six issues a year. Published two-monthly in south africa by crafters for crafters, Craftwise Magazine is loaded with step-by-step projects to inspire people who love to creative pretty things. Project themes are wide ranging, painting, chain maille, including mosaics, stained glass, kids crafts, jewellery, paper crafts, beading, recycling, pewter, decoupage, mixed media, upcycling, ceramic painting, scrapbooking and more. Warners Group - Whether you are a keen embroiderer or simply love fabric and textiles, Embroidery magazine is filled with ideas and features to inspire you. Each edition is packed with colourful features on contemporary and traditional textiles, and keeps you up to date with news of the latest shows and events taking place around the country. F+W Media - Quilting arts magazine encourages quilters to create one-of-a-kind works of art! Covering all types of quilting, and embellishment techniques, surface design, the magazine is geared for the seasoned quilter as well as the beginner. Learn design tips and tricks from the world’s most renowned and innovative teachers and quilters. 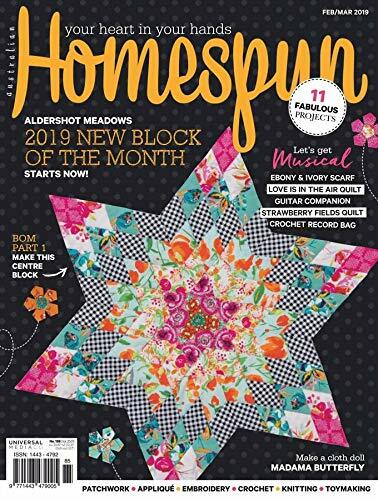 Immediate Media Company London Ltd - Whatever your quilting ability, from beginner to beyond, we share your love for patchwork and quilting on every single page! *Please Note: Our digital edition does not include the covermount items or supplements you would find with printed copies*. With a mix of large designs to get your teeth into, and smaller ones to whip up quickly, you'll always have a make on the go. Step-by-step instructions make each project easy to follow, contemporary inspiration to spark your creativity, the latest fabric collections you'll want for your stash, and news, fascinating features about the designers you love, while top tips and crafty ideas ensure you're always discovering new skills and ways to use your fabric! Every month you'll also find new techniques to try, reviews and advice to help you get the most from your hobby. Love Patchwork and Quilting - In love patchwork & quilting you'll find gorgeous modern quilting projects for all abilities, from fabulous quilts and cushions to fun gifts and on-trend home-style. Aceville - The uk's leading craft title featuring papercrafts, freebies & prizes, knitting, home crafts, cardmaking, stitching, patchwork, soft toy patterns, free downloads and templates.